Read the opening paragraphs from this book. A man who can disappear; a woman who can see the future; a boy who kills his brother and loses the ability to speak; a man raised in a cult who now believes he is destined to die: The Affliction is a novel in stories that artfully weaves together the lives of its characters in ways both surprising and, in the end, inevitable. Diego Flores meets Ricardo Blanco, a damaged man who tells him about Javier Castillo, a man he once knew who could vanish into thin air. This sets into motion a chain of events that not only transforms Diego's life but that of many others. "…Capturing a community, these linked stories open with The Affliction, which details Javier Castillo’s astonishing ability to disappear and reappear at will….of course being invisible, like so many people in marginalized communities, is as disquieting as being among the ‘disappeared’ of Latin American history…. A heartfelt and well-crafted work." "In Young’s intriguing debut, memorable protagonists are introduced in individual stories before their worlds converge. In the title story, an otherwise ordinary man named Javier Castillo has the ability to disappear and reappear at will. The knowledge of this is a burden to his friend Ricardo, who tries to tell others about Javier’s talent but is never believed. A different kind of invisibility afflicts Leenck in “The Experiment”: an entire town lives under a kind of pall of impending doom, more debilitating for its lack of specificity. For his part, young Leenck—without logical explanation—expects to be felled by his father’s axe at any moment. “Inside the Great House” documents the life of “crazy old Cassie,” who starts as a nun but ultimately communes with the devil. “The Fortunate” follows the elderly Flora Diaz, who is a bit of a mystic and a figure of some authority to her neighbor Rosa, who becomes obsessively dependent on Flora’s perceived psychic gifts. People and things in Rosa’s world appear or disappear, without seeming logic... In the subsequent six stories, there’s more overlap of characters, more drama, and more manifestations of the affliction (though it’s never explained), giving the whole volume the feel of a set of nesting dolls. [Young] creates an effectively menacing mood, uniting all the strange stories in a satisfying manner." "Young’s characters, haunted by trauma, scarred by heartbreak, are connected through their common afflictions. This is a bond that transcends kindred, culture, even time. Is it true, then? Are we all connected? According to Young, '…there are threads between everyone, even when you cannot see them.' The Affliction is a haunting book, one that is rooted in a binding beautiful magic. Quite like Young’s characters, we are left charting their connections to the beauty and loss found on each page." "I devoured this book. For its mysteries, its generous heart, its intellect and meta-commentary about memory and story, this novel most reminded me of Gabriel Garcia Marquez, which I mean as a high compliment. Seek it out, if for no other reason than to encourage a brilliant poet (and storyteller) to soon reward us all with another beautiful and stirring novel." "The linked stories in C. Dale Young's The Affliction send us off to a magical location, where the fantastical can seem both miraculous and ordinary. These tales treat life-and-death matters with a beautifully eloquent fervor, and, like the stories of Julio Cortazar, they remind us of how varied and unpredictable short stories, like the world itself, can be." 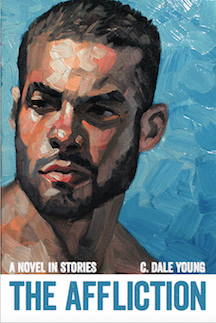 "C. Dale Young’s stories masterfully illuminate the moments in which regret and longing and grace powerfully collide—and transform the topography of a life. The Affliction is an exhilarating collection: I emerged deeply grateful for the existence of this book." "Tongue or no tongue, the truth always [comes] out.” The Affliction unspools a history of disappearance and secrecy and traces how our personal lives can be haunted by ghosts not even of our making. One discrepancy, one exaggeration, or one florid recollection, Young suggests, and the reality we know can dissolve before our eyes. This is a fascinating, multilayered collection that thrillingly moves us to consider why the very act of telling a story—and making every detail loyal to both history and the heart—is truly “the gift of understanding."